BEIRUT Israeli warplanes struck areas in and around the Syrian capital Sunday, setting off a series of explosions as they targeted a shipment of highly accurate, Iranian-made guided missiles believed to be bound for Lebanon's Hezbollah militant group, officials and activists said. The attack, the second in three days and the third this year, signaled a sharp escalation of Israel's involvement in Syria's bloody civil war. Syrian state media reported that Israeli missiles struck a military and scientific research center near Damascus and caused casualties. Syria's government called the attacks against against its territory a "flagrant violation of international law" that has made the Middle East "more dangerous" and warned it has the right "to defend its people by all available means." The generally muted response, read out by the information minister after an emergency government meeting, appeared to signal that Damascus did not want the situation to escalate. Instead, it tried to use the strikes to taint the rebels, claiming the attacks were evidence of an alliance between Israel and Islamic extremist groups trying to overthrow President Bashar Assad. The air raids pose a dilemma for a regime already battling a relentless rebellion at home. Failure to respond could make it look weak and open the door to more strikes. But any military retaliation against Israel would risk dragging the Jewish state and its powerful army into a broader conflict. The tempo of the new strikes added a dangerous dynamic to the conflict, fueling concerns that events could spin out of control and spark a regional crisis. Israel's military on Sunday deployed two batteries of its Iron Dome rocket defense system to the north of the country. It described the move as part of "ongoing situational assessments." The airstrikes come as Washington considers how to respond to indications that the Syrian regime may have used chemical weapons in its civil war. President Barack Obama has described the use of such weapons as a "red line," and the administration is weighing its options  including possible military action. Iran, a close ally of the Assad regime and Hezbollah, condemned the airstrikes, and a senior official hinted at a possible response not from Terhan, but rather its proxy, Hezbollah. Gen. Masoud Jazayeri, assistant to the Iranian chief-of-staff, told Iran's state-run Arabic-language Al-Alam TV that Tehran "will not allow the enemy (Israel) to harm the security of the region" and that "the resistance will retaliate against the Israeli aggression against Syria." Israel and Hezbollah have a long history of enmity, and fought a punishing monthlong war in mid-2006. The militant group fired thousands of rockets at Israel, while Israeli warplanes destroyed large areas of southern and eastern Lebanon during a conflict that ended in stalemate. Israel is especially concerned that Hezbollah will take advantage of the chaos in neighboring Syria and try to smuggle advanced weapons into Lebanon, particularly those that could hamper Israel's ability to operate in Lebanese skies. Israeli officials believe that Iran and Hezbollah are stepping up their efforts to smuggle weapons because they think Assad's days are numbered. They also think the Syrian leader is cooperating because he is weak and he owes Hezbollah, which is understood to be sending men to fight alongside government troops, for its support. The officials, who spoke on condition of anonymity because they were not authorized to brief the media, said Israel will continue to strike Syria if the smuggling attempts continue. Syria's state news agency reported explosions at the Jamraya military and scientific research center near Damascus and said initial reports indicate they were the "result of Israeli missiles." It said there were casualties but did not give a number. Damascus-based activist Maath al-Shami said the strikes occurred around 3 a.m.
"The explosion was very, very strong," he said, adding that one of the attacks occurred near the capital's Qasioun mountain that overlooks Damascus. He said the raid targeted a military position for the elite Republican Guards unit that is in charge of protecting Damascus. Mohammed Saeed, another activist who lives in the Damascus suburb of Douma, said "the explosions were so strong that earth shook under us." He said the smell of the fire caused by the air raid near Qasioun was noticeable kilometers (miles) away. 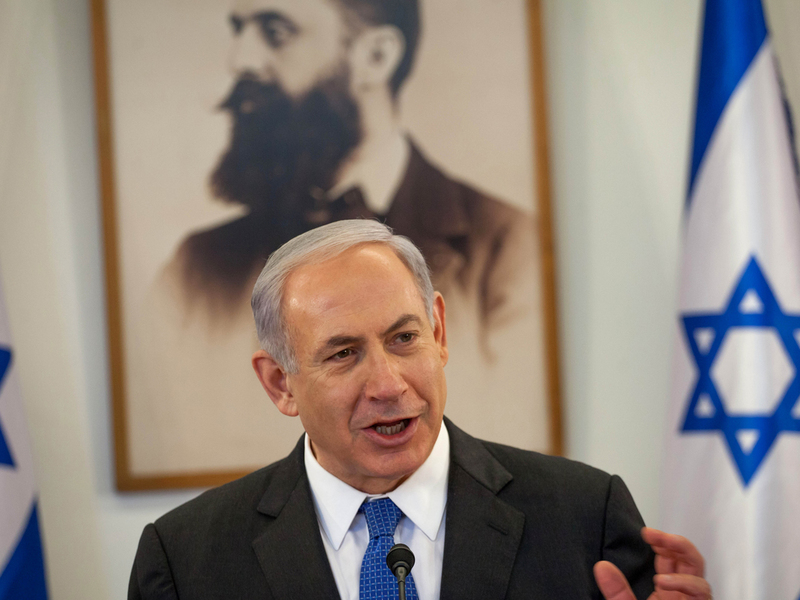 In Jerusalem, Israeli media reported that Netanyahu was holding an emergency meeting of his inner Security Cabinet. The prime minister's office declined comment. Israeli officials say they do not think Assad will retaliate in the immediate future, but they are certainly bracing for that possibility with the deployment of the two Iron Dome batteries to Israel's north. Earlier this year, the Iron Dome system was credited with shooting down hundreds of rockets during a round of fighting against Hamas militants in the Gaza Strip. Amos Yadlin, a former head of Israel's military intelligence, said the strikes on Syria are a signal to Damascus' ally, Tehran, that Israel is serious about the red lines it has set. Like the Syrian regime, Iran also portrayed the strike as evidence of collusion between Israel and Syria's rebels. Iranian Defense Minister Gen. Ahmad Vahidi was quoted by the official IRNA news agency as saying the attacks show a growing alliance of convenience between the Syrian opposition and Israel. "These vain moves are not a sign of Israel's power," he said. "It rather shows the (Israeli) regime's despair in the face of regional developments." Iran has provided both financial and military support to Hezbollah for decades, and has used Syria as a conduit for both. If Assad were to fall, that pipeline could be cut, dealing a serious blow to Hezbollah's ability to confront Israel. The Fateh-110, or "Conqueror" in Farsi, is a short-range ballistic missile developed by Iran and first put into service in 2002. The Islamic Republic unveiled an upgraded version in 2012 that improved the weapon's accuracy and increased its range to 300 kilometers (185 miles). Vahidi said at the time that the solid-fueled missile could strike with pinpoint precision, making it the most accurate weapon of its kind in Iran's arsenal. Israeli officials say that Hezbollah managed to get an older version of Fateh-110s back in 2010, but the missiles that were destroyed in the recent airstrikes are an upgraded version. Israeli intelligence thinks Hezbollah has not succeeded in getting any of these game changing weapons since the Syrian civil war erupted, according to the officials. An Israeli airstrike in January also targeted weapons apparently bound for Hezbollah, Israeli and U.S. officials have said. The White House had no immediate comment on Sunday's reported missile strikes. Hezbollah's Al-Manar TV said the research center in Jamraya was not hit, but instead an army supply facility that produced food products for the military. It quoted unnamed Syrian security officials as saying that three sites including military barracks, arms depots and air defense center were targeted by the strike. The station aired footage showing a heavily damaged building as well as what appeared to be a chicken farm with some chickens pecking around in debris scattered with dead birds. A road apparently next to the site was filled with debris, and shell casings were strewn on the ground. A blue street sign on the side of the road referred to the direction of the Lebanon border and the Syrian town of Zabadani near the frontier. Lebanon's Al-Mayadeen TV, which has several reporters around Syria, said one of the strikes targeted a military position in the village of Saboura, west of Damascus and about 10 kilometers (six miles) from the Lebanon border. An amateur video said to be shot early Sunday in the Damascus area showed fire lighting up the night sky. The video appeared genuine and corresponded to other AP reporting. Uzi Rubin, a missile expert and former Defense Ministry official, said Fateh-110 missiles would put almost all Israel in range, although he emphasized that he was speaking as a rocket expert and had no details on reported strikes. He said the rockets are much five times more accurate than the scud missiles that Hezbollah has fired in the past. "It is a game changer because they are a threat to Israel's infrastructure and military installations," he said.